Katzentisch: Merry Christmas! Frohe Weihnachten! Wishing you a gorgeous Christmas and lots of gifts! Again, this year the family gathering took place at my home. But for the very first time we met yesterday, on Christmas Eve. Christmas Eve to Germans is much more important than in most other countries. Ich wünsche euch ein wunderbares Weihnachtsfest und 'ne Menge Geschenke! Auch dieses Jahr fand das Familienessen wieder bei mir statt, aber im Gegensatz zu früheren Jahren haben wir uns dieses Mal an Heiligabend getroffen. 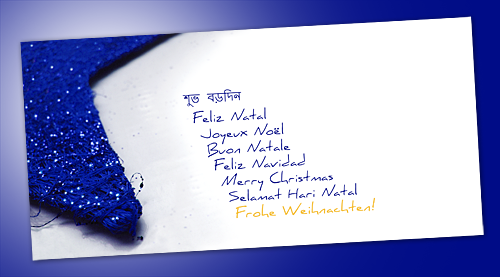 If you're interested in the languages on the Christmas card, here they are from top to bottom.